Eating Fun 9, originally uploaded by StephLewis. He’s also an eating machine. The doctor said that babies run a spectrum from being very eager eaters to being very finicky (in terms of eating “real” food vs. baby food). Caleb eats pretty much everything (except the “baby no-no” foods), and most of these are things from my plate that I just chop up for him. 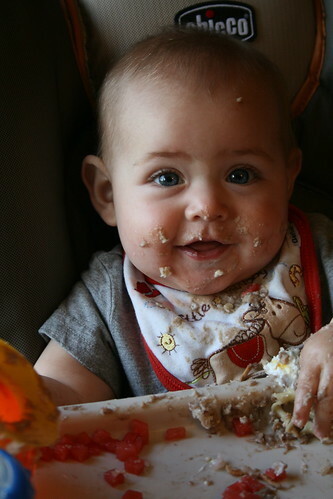 He will refuse baby food unless it is chunky, so I’ll usually mix something in with it (usually rice or cereal puffs). His favorite foods now are cheetos, garlic cheesy toast, green beans (whole, cooked), meat, cottage cheese, and garlic mashed potatoes. I find that a dash of garlic or cinnamon can make the difference between lips clamped shut or mouth wide open. So, he’s definitely a connoisseur. He’s growing, he’s fantastic, and I’m loving every minute of it.